The Alpena is one of the most famous shipwrecks on the east shore of Lake Michigan. 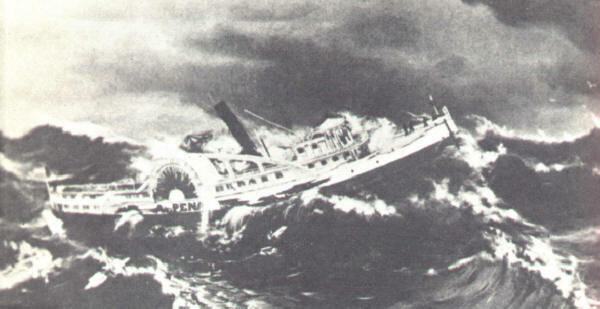 The vessel disappeared in October, 1880, during a storm known as “The Big Blow” due to the devastation it caused throughout the Great Lakes. The Goodrich side-wheel steamer Alpena was built by Thomas Arnold of Gallagher & Company at Marine City, Michigan in 1866. At 197 feet in length, with a 26.66 foot beam and a depth of 12 feet, the vessel was rated at 654 tons. The wood-hulled steamer was powered by a single cylinder, vertical beam engine which drove a pair of 24′ radius side wheels. It was distinctive due to the “walking beam” engine, which was plainly visible above the massive side wheels. It had a pilothouse forward, strengthening arches along each side and a single stack. When the wreck of the Alpena is found, it will be these distinctive paddlewheels and the vertical beam engine that will enable researchers to identify it. The Goodrich line had purchased the vessel from Gardner, Ward & Gallagher in April, 1868. It was completely overhauled at Manitowoc, Wisconsin in the winter of 1875-1876 and under the capable hand of Captain Nelson W. Napier of St. Joseph, Michigan. The Alpena left Grand Haven, Michigan bound for Chicago on Friday evening, October 15, 1880, at 9:30 PM. The weather was beautiful — Indian Summer like. But the barometer was indicating a storm and storm signals were out. The Alpena was spotted on her southwest journey by the crew of the steamer Muskegon at about 1:00 AM and everything seemed normal. At about 3:00 AM Saturday, October 16, 1880, the “worst gale in Lake Michigan recorded history” swept across the lake. The Alpena was seen at 6:00 AM, 7:00 AM and at 8:00 AM by the schooner Irish and by Captain George Boomsluiter of the barge City of Grand Haven when about 35 miles off Kenosha, Wisconsin, laboring heavily in the high seas. Several other vessel captains, one of whom reported the Alpena lying on her side with one of her paddle-wheels out of the water, spotted the vessel over the next several hours. Ten car loads of apples were stowed on her main deck and some speculate this cargo became unmanageable in the storm, shifted, and led to the capsizing. Reports indicate the Alpena may have drifted north the rest of the day — and perhaps until Sunday morning — then back toward the east side of the lake. The wind shifted to the west/northwest and brought debris onto the beaches at Holland, Michigan. The Saugatuck Commercial Record newspaper reported shingles, lath, lumber and other pieces of the ill-fated Alpena were scattered thickly on the shore there. It also was reported that thousands of apples were found bobbing in the surf at Saugatuck. No exact count of the victims is available, although the Holland City News stated 80 persons may have been on board. 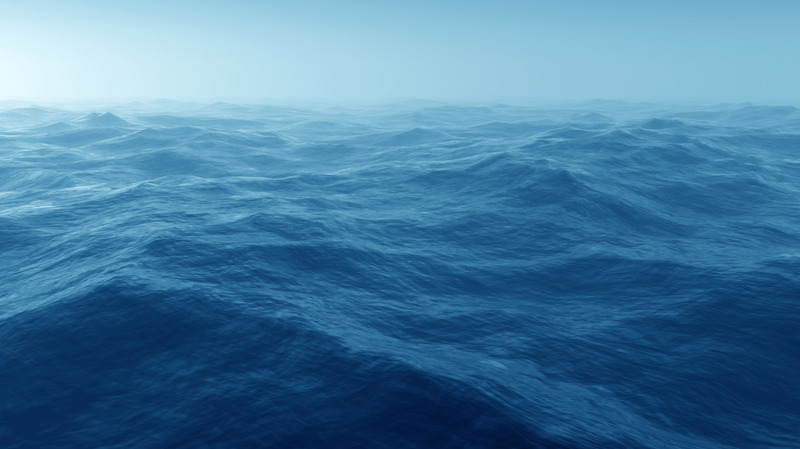 the only passenger list was aboard the vessel at the time of the loss. 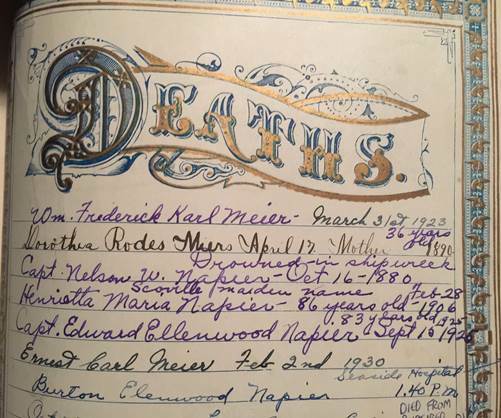 The following names were acquired from microfilm of the Holland City News at the Herrick District Library in Holland, Michigan. Some may be misspelled due to the condition of the microfilm and photocopy. 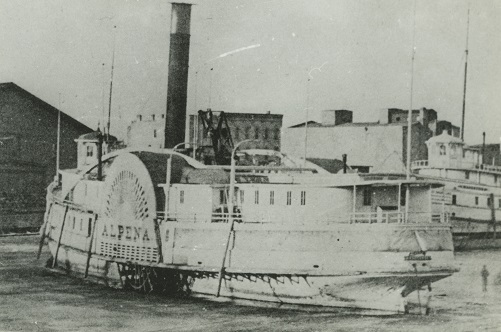 Other information has recently been uncovered by researcher Kathy Mihalenko as she searches for an ancestor believed lost on the Alpena, including later articles revealing several though to be on board were not. This list is revised as of 20 January 2013. An email from Don Castle of Ontonagon, Michigan also claims that Isaac Bush age 56 and his wife Charlotte (Castle) Bush, age 56 died in the loss of the Alpena. There were many others whose names may never be known since the only passenger list went down with the ship. Several artifacts from the Alpena, including a piano leg, may be seen at the Holland Museum at 10th Street and River Avenue in Holland, Michigan. The location of the Alpena remains a mystery. No doubt she will be found eventually — but will she reveal the secrets of her last few hours on Lake Michigan. Only time will tell.